Is your neck giving away your “true” age? The neck area is comprised of delicate skin and as we age it becomes susceptible to wrinkles, pigmentation, and a “hanging” appearance. The reasons for this include sun damage, gravity, fat accumulation and heredity. Neck rejuvenation is a wonderful way to restore youthful contours and make a positive difference in your appearance. As the Cosmetic Surgery Center in Santa Barbara, we offer various surgical neck rejuvenation options (all done without general anesthesia) and a surprising non-invasive option for a younger-looking neck. Neck Lift. If your neck has sagging skin with excess wrinkling, neck lift surgery is a good option. The skin is tightened and muscles are often tied together in the midline to help create a “sling effect” for better support. Excess fat is removed and a suspension suture is often placed to give more long-lasting support to the neck. The surgery is usually done hiding incisions behind the ears and a small one under the chin. The muscle bands are sewn together and extra fat is trimmed. Sagging skin is removed to re-contour the neck. A short zig-zag incision is hidden behind the chin. Especially good for men who are starting to see a “turkey neck”. Submental Liposuction. Improving your double chin can often be done with liposuction. This procedure will remove excess subcutaneous fat and is best done on patients with good skin tone. Liposuction can address the submentum, anterior neck and even some of the jowls. It can be done through a tiny incision hidden behind the chin. When properly done it will “sculpt” the tissues so the youthful contour of your neck will be restored. Platysma Plication. The platysma muscle stretches from the clavicle (collar bone) to the lower face. As we age the skin elasticity of the neck decreases and contraction of the platysma starts to cause banding of the overlying skin creating a “turkey neck” appearance. Plication means sewing the right and left platysma muscles together in the midline to allow them to return to their normal position. This is accomplished through a small incision hidden in the crease behind the chin. Minimally-Invasive Neck Suture Lift. This surgery is designed to lift and support the neck skin with special sutures that encourage scar tissue in-growth to “attach” the skin to the suture. Sometimes referred to as a “thread lift”. Less invasive than a traditional neck lift with a shorter healing time. Ideal for a person who’s aging neck issues are in the earlier stages. Non-Surgical Neck Rejuvenation. Many people are surprised to find out that Botox and Dysport an be used for non-surgical neck rejuvenation. Botox or Dysport is injected into the platysma muscle causing relaxation of the muscle. When the muscle is relaxed, the appearance of the neck banding or “turkey neck” is reduced. Results last about 3 to 4 months. Neck rejuvenation can truly turn back the clock on your appearance and there are many options for different stages of the aging neck. Call our office – 805-563-0000 – to schedule a neck rejuvenation consultation today. Neck Lift cosmetic surgery in Santa Barbara is most commonly known for getting rid of the double chin or the “wobble” in the neck area but you would be surprised at how much it can truly change an appearance. Before we discuss the results, let’s look at why Neck Lift surgery may be needed in the first place. Neck skin is delicate – more so than facial skin – and is exposed to the same elements as the face but often times it is neglected. I always like to remind people that their skin care routine should not stop at the jawline. I recommend cleansing, moisturizing, and (most importantly) using sun screen on the neck area. Due to the delicate skin (and possibly lack of sunscreen in that area), the neck may age prematurely causing the skin to become loose and crepe-y. The “double chin” may be due to a number of causes including genetics, weight gain, weight loss after weight gain, loss of muscle tone, and, of course, aging. The patients I see at Cosmetic Surgery Center in Santa Barbara are interested in Neck Lift surgery because they feel that their neck looks “old”. We can restore their neckline to what it once was by tying muscles to create a “sling effect” for better support and adding a suspension suture to give more long-lasting support to the neck. Incisions are hidden behind the ears and a small one under the chin. 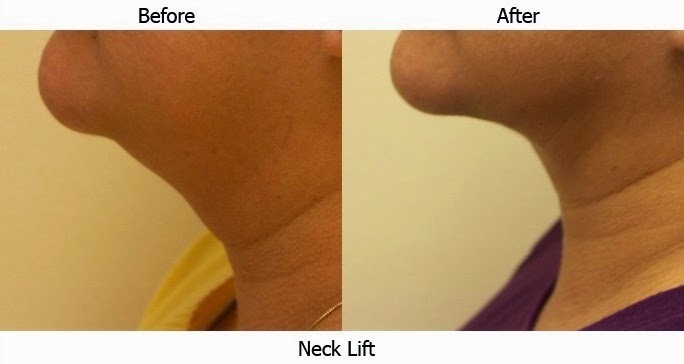 Neck Lift surgery can get rid of the double chin and re-contour the face. With the “heaviness” gone from the neck and jawline, many of my patients report that their updated appearance not only makes them look younger but also makes them look like they have lost weight! I perform cosmetic surgeries that give a natural, rested, “non-operated” look. If you are interested in Neck Lift surgery in Santa Barbara call my office – Cosmetic Surgery Center – at 805-563-0000 to schedule a consultation appointment.